Drop in at Vivid Projects on Friday 5 December for a double presentation as part of Digbeth First Friday. With new music by LARVA. 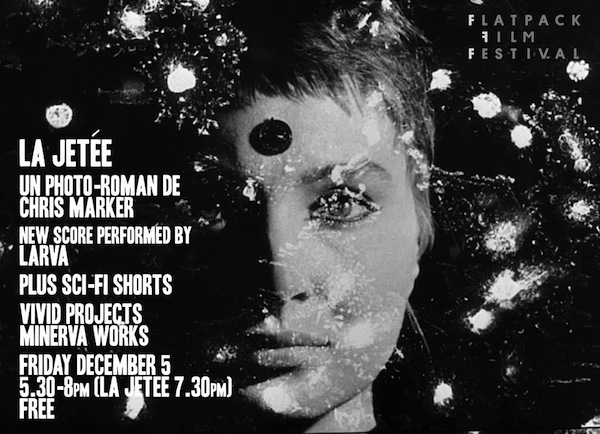 Following recent live scores for cult psychedelic films The Mask (1960) and Idaho Transfer (1973), Larva will be accompanying Chris Marker’s famed black and white science fiction “photo-roman”, La Jetée(France, 1962 – 28min). The short film’s theme’s of memory and circular time will be echoed in a score featuring analog synths, glass instruments and guitar drones. A tale of time travel told in still images taking place in a post-atomic Paris, La Jetée is one the most influential and radical examples of sci-fi filmmaking as well as a milestone in the history of short film format. LARVA is a group of artists variously comprising Scott Johannsson (Film Ficciones, Outer Sight), Nick Sales (Bliss Body, Bow Gamelan Orchestra), Sam Owen (Pram, Two Dogs), James Smith (Betty & The Id, Ray Vorg) and Laurence Hunt (Pram, Modified Toy Orchestra). An hour long supporting programme of sci-fi shorts will play through twice from 5:30pm – 7:30pm before La Jetée starts at 7:30pm.